In the Hamzanama, a wide-ranging adventure story known in oral and written form throughout West and South Asia in Persian, Urdu, and other languages, there are so many hostile challenges to be met and dastardly menaces to be parried that there is never a lack of opportunity for heroes to prove their mettle. Sometimes these heroes must pass trials that are mostly tests of sheer physical prowess and moral superiority, and involve the physical defeat of a formidable unbeliever. At least as often, however, they must avail themselves of guile and derring-do to achieve their desired outcome. Such is the case in this painting from the great Hamzanama manuscript, a magisterial project of 1400 illustrations produced under the auspices of the Mughal emperor Akbar over fifteen years, a period reckoned in the most recent scholarly accounts to be 1557/58 – 1572/73. The trio on the run are rendered in a relatively large scale in the upper right, the ayyar gazing forward and upward, and the two would-be lovers looking back towards the hoodwinked army giving futile chase. Turbulent waves roil the sea behind them, adding to the sense of hurried movement. The figures themselves are a veritable tangle of limbs. The two figures sit high on ‘Umar’s shoulders, Gawhar Malik’s booted legs pointing leftward (opposite the orientation of his body), and Gulrukhsar’s lone visible leg planted on ‘Umar’s thigh. The spy’s own cloak and spindly legs jut outwards, and sword, sceptre, and spear become complementary thinner protrusions from the figural mass. The overall composition is dominated by one unusual element. Looming in the centre is a tall mountain, a triangular heap of puffy rocks organised into broad arcs and barren but for eighteen discrete clusters of assorted flowers, several of which are very finely done. Its compositional function must be to literally put ground between guards and fugitives, and thereby suggest the latter’s ongoing escape. Coursing diagonally though the remainder of the scene is a narrow rock-lined stream that flows by three different kinds of trees. The first has a cylindrical and twisted double trunk, palpable bark, a web of roots, and spade-shaped leaves outlined in gleaming yellow. The second is a dark green mass overlaid with uniformly narrow, yellow-rimmed leaves. But it is the third tree that is rendered in a truly eye-catching manner: a flurry of extremely painterly yellow daubs inundating the green foliate cluster at its centre. Such a radical expressionistic technique appears occasionally in the Hamzanama, and is regarded as the purview of only a handful of artists, namely, Daswant, Basawan, and Kesava Das. Here, however, its use is limited to a single passage that lacks even the loose structure of marks seen elsewhere. In short, it seems to represent an initial attempt at an experimental technique by a mainstream artist who normally did not venture far in that direction. That artist is Mahesh, an accomplished and prolific painter who contributed a number of paintings to the Hamzanama project and continued to serve in the imperial atelier until 1600. The key element supporting an attribution to Mahesh is the figure style, which is amply displayed in the many soldiers astonished by the getaway. Mahesh’s warriors have flat faces with thin features, especially distinctive slit-like eyes, and tend to wear armoured tunics studded with an oversize polka-dot pattern. The artist displays a predilection for large, flat shapes, a habit evident in such objects as the horses’ caparison. He enlists numerous battle flags as a device to punctuate masses of troops, distributes patches of his favourite colours – yellow and red – as compositional accents, and repeats specific decorative patterns, such as the now abraded radiating design on the red shield in the lower right, from his other Hamzanama paintings. Although the fleeing heroes have suffered some surface damage, most obviously in the face of Gulrukhsar, their facial articulation and dress here correspond to Mahesh’s figures elsewhere in the Hamzanama. The three-quarter view of Gawhar Malik’s large and smooth face, for example, matches that of another hero, Qasam al-‘Abbas, in the form of the nose and eyes, and particularly in the rendering of the latter with a narrow gold rim around the black pupil. Likewise, the white diamond pattern on Gawhar Malik’s tunic is quite rare, but occurs in almost the same formulation in another of Mahesh’s paintings in the manuscript. This stands in contrast to the dense and irregular chainmail pattern on his leg armour, which has no known counterpart in Mahesh’s work. Conversely, the billowing shape and light articulation of the rocky landscape are entirely in keeping with the artist’s oeuvre. The numeral 46 scrawled on the painting near the top of the mountain does not belong to any series of numbers, and remains inexplicable. 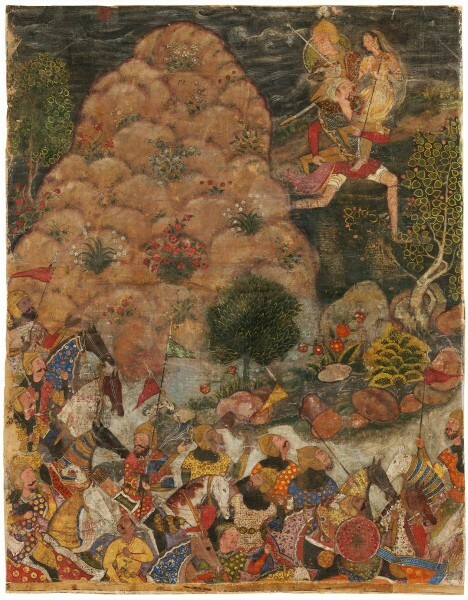 Other Hamzanama paintings attributed to Mahesh are published in John Seyller et al, The Adventures of Hamza: Painting and Storytelling in Mughal India (Washington, D.C., 2002), nos. 22, 26, 39, 43, 46, 49, 52, 65, 70, and 71. A sample of a painting ascribed to Mahesh is published in Seyller et al 2002, fig. 30. Seyller et al 2002, no. 46. Seyller et all 2002, no. 52. Published: Seyller et al 2002, R163, p. 277. Seyller, John, et al. The Adventures of Hamza: Painting and Storytelling in Mughal India. Washington, D.C.: Freer Gallery of Art and Arthur M. Sackler Gallery, Smithsonian Institution, in association with Azimuth Editions Limited, London, 2002.